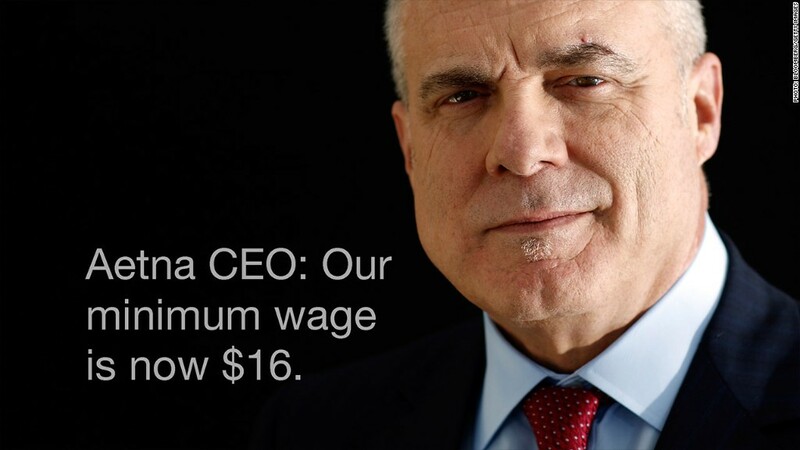 Thousands of Aetna employees are getting a hefty raise. The health insurer is increasing its minimum hourly wage to $16, starting in April, as a way to attract and retain talented employees. And it will lower the cost of health benefits for some staffers next year. Aetna is following several other companies that have recently raised pay amid a nationwide stagnation in wages. About 5,700 Aetna (AET) employees in the U.S. will benefit from the raise, mainly in customer service, claims administration and billing. The company said it wants to invest in workers who deal with Aetna's clients and to build a more productive workforce. "Many of these employees are the face of the company to customers every day," Aetna said in a release. Share your story: Are you expecting a raise in 2015? The improving economy played into the insurer's decision. Reducing turnover and recruitment expenses outweighs the cost of the pay raise and reductions in health care costs. "As the American economy recovers, Aetna is leaning into that recovery and making these improvements so our colleagues who are vital to our success can benefit from it," said the company, which has more than 48,000 workers total. On average, the pay hike translates to an 11% raise, but some workers may get as much as 33% more. This also gives workers the opportunity to receive higher bonuses and 401(k) contributions. Aetna is also looking to lower health care costs for its employees. Next year, roughly 7,000 staffers will be eligible for a program that lowers out-of-pocket health care expenses by as much as $4,000. To qualify, employees must meet certain income requirements and engage in wellness programs. Nationwide, wages have stagnated for several years. In 2014, the average hourly earnings rose only 1.7%, barely above inflation. Most economists expect pay to tick up only slightly this year. States and cities are taking the lead on raising the minimum wage, with some 20 states and Washington D.C. upping their hourly rates this month. Some companies are also boosting wages. Starbucks (SBUX) is increasing the pay of baristas and shift managers starting this month.